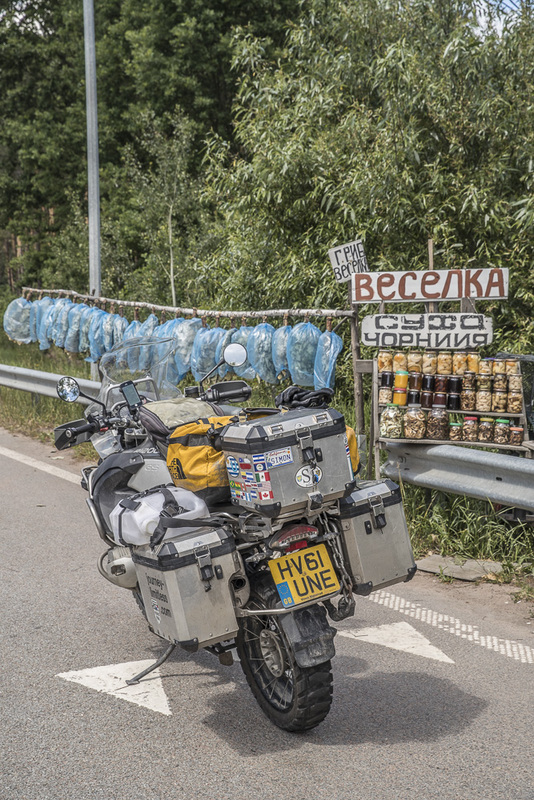 Riding along Ukraine’s few highways was great fun. Often there would be an old lady by the road, selling wild berries and homemade preserves and pickles. We pulled over to buy a jar of blueberries and a punnet of wild strawberries in honour of both our childhoods. Simon remembers Polish wild blueberries by the road, how tasty they were in the summertime on road trip holidays with family, and for Alex, wild strawberries evokes memories of childhoods spent in France, the endless summers at her grandmother’s house overdosing on berries in the garden. We pulled over on the motorway after passing half a dozen similar posts, old ladies tending their wares and waiting for customers. A tiny old lady appeared out of nowhere as soon as we pulled over and laughed when she saw how big our bikes were. Simon asked her for blueberries and strawberries and she produced a bucket of glistening freshly washed fruit. She filled a small pot with each and charged us the equivalent of £1 for each kilo. Camping in a petrol station, cooking a sausage casserole and making friends with the local dogs, we felt that we were close to the end of the journey. The scenery felt familiar, the food was starting to taste like home cooking and even the air smelt the same as before with the smell of summer grass and cleaner petrol fumes! The road was revealing familiar landscapes- the houses started looking central European, their practical and sturdy construction telling of harsh winters and long, cold nights. The steady greyness of the roadside marched along the summer grass and before long we could see signs for the border with Poland. We passed a whole cavalcade of bikers, Alex earnestly swinging a peace sign in salute, only to be silently stared at and ignored by each one of the hundred bikers we passed (they were Goldwing riders, standard behaviour). Getting more and more irate at their constant unfriendliness, the peace sign became a more unflattering salutation by the time the last rider rolled past, back they way we’d come. Letting our irritation seep away, we felt Europe was whispering on the breeze and we knew we’d arrived when we were then faced with a kilometre queue of cars. We obediently waited to be beckoned by the police officer at the gate to join the queue of waiting vehicles. In front of us- a wall of waiting cars and caravans. Nothing was moving through the covered border crossing. We parked and waited, meditating on a chocolate bar, a treat after months of no chocolate (the last time was in Canada!). Moments later, three Harleys pull up next to us, the three Poles riding grinning at us and introducing themselves. Before long we were all chatting (not Alex as her Polish is non-existent, limited only to important phrases like “Cheers” and “Yo, granny!”) and it turned out they’d just returned from a WWII inspired ride, as confirmed history buffs and Polophiles, they love discovering strategically important sites from the war. At least they weren’t part of the unfriendly swarm we’d come across earlier. When we asked if they’d seen them, they shook their head and smiled and said “Night wolves, they’re all violent and unfriendly.” Apparently we’d been giving the finger to one of the most murderous biker gangs in history!! 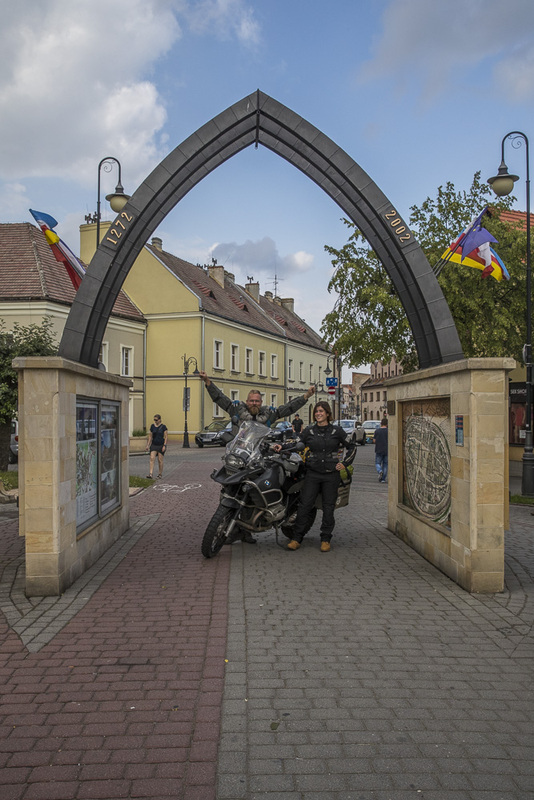 Theses Polish bikers knew about them because the Night Wolves have been banned from as lot of sites in Europe as they desecrate sites in the name of remembering the losing side of the war. They ride Goldwings so it’s only to be expected. We told our new friends about our recent journey and how this was a homecoming. Amazed, and congratulatory, they insisted on riding to the front of the queue. 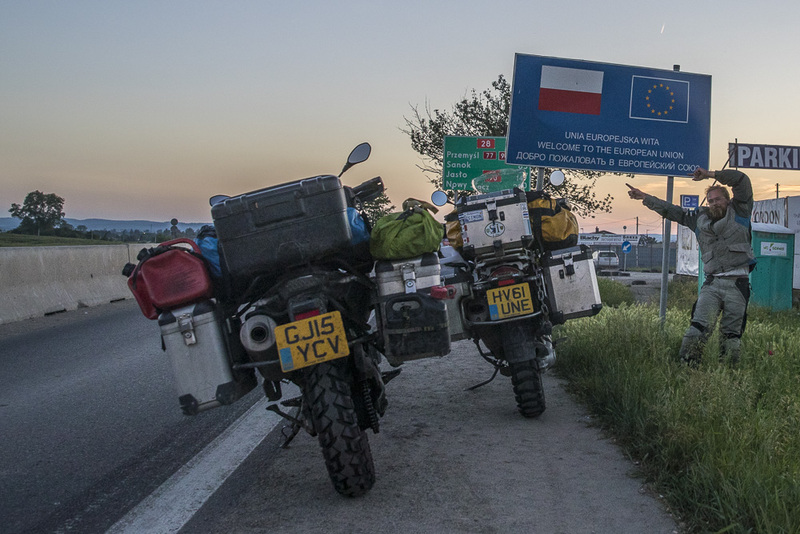 Simon translated for Alex by explaining that they were going from car to car telling them of Simon’s feat and reprimanding them for not letting us pass as he should be hailed as a hero- one of the only Poles to circumnavigate the globe by motorbike and he’s home! Let him pass! Everyone was pretty happy to let us through to the front, armed with our new friends, we zoomed to the front of the queue accepting hellos and congratulations as we passed. Our new friends were even more generous when they invited us to stay in their accommodation for the evening – would we join them for soup at the eco-hotel they’d found? Completely touched by their kindness we couldn’t refuse. We made it through the border with our smuggled single bottle of Georgian wine, looking forward to an evening of stories and kindness. we make it to Poland!!!! Back in Europe! We followed our new friends to the agro-tourist hotel near the border. (Note from author: I’m ashamed to say I’ve forgotten the name of the hotel, as it was a really nice, sweet place to stay. The owner was a great guy who let me eat the strawberries he’d grown in the garden and gave us a little cabin to sleep in which was comfortable and warm.) We were fed soup, cheese and pate and shared stories of our rides. It was a really nice evening and we were made to feel so welcome! The next morning, it was time to leave and we had a send off fit for kings. The next stop was Krakow where we were to meet our families who we’d not seen for a year, so despite the comfort of the moment, we were eager to press on. Soon the dense pine forest of the east gave way to a beautiful motorway with green eco-bridges spanning across the top. One of our new biker friends had been telling us he’s a professional hunter because the new motorway designs (with green bridges) meant that the wild boar population was booming out of control and people like him were hired to cull them but that it was a full time job nowadays. The bridges were wide and full to the brim with vegetation. It was so lovely to know that the wildlife in the area was safe from speeding vehicles. Soon we were in Krakow, the beautiful buildings welcoming us with their promise of celebration and reunions. We pulled up to the air bnb Alex had organised for her parents and soon they were reunited, one smelly biker with her two aged parents! That evening was the big family reunion, the Pruciaks and Reddaways joined together to celebrate our engagement and future union and our return. Alex managed to practice her few words of Polish – Cheers and Yo, granny! to her heart’s content. 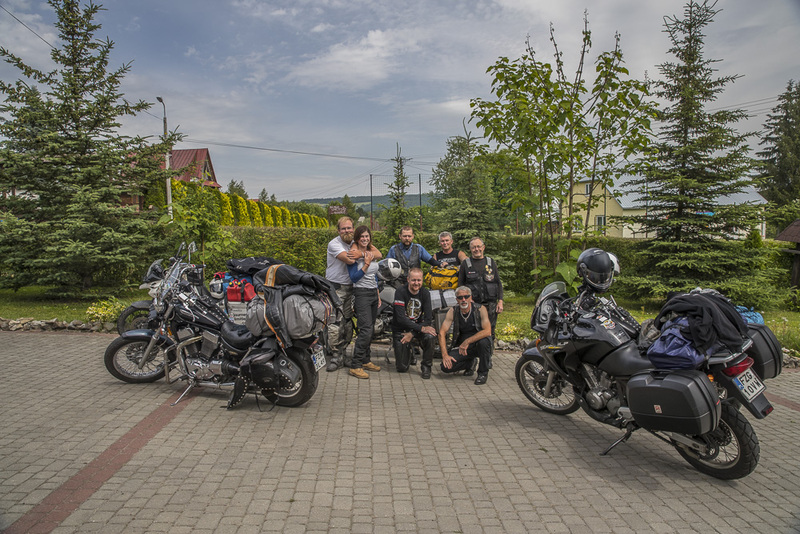 After a lovely few days showing Krakow to the Reddaways, Simon and Alex rode down to Zory. Simon had officially done a full circumnavigation and Alex could finally get her bike serviced. It was bad news for Freja… she was going to need a full 3 week’s to fix the damage sustained in India when the bus ran into her. The front forks had been leaking and it wasn’t just the seals, the whole alignment was out, the forks now twisted instead of perfectly parallel. This was a huge setback as Alex was due back at work in 2 weeks and didn’t have the luxury of time to wait for forks to be replaced. Determined to finish the journey by bike, Simon found a rental company which would rent us a motorbike to return home with. We picked up the bike, a 1997 BMW R800, complete with panniers, to commence the last leg back to the UK! Please enter an amount of your choosing below. Any amount helps keep us fed and the petrol flowing. All content and images Copyright © 2016 Journey Limitless. Website designed by One Day Labs.